Miami Book Fair an kolaborasyon avèk Sosyete Koukouy ap prezante “Little Haiti Book Festival” samdi 5 me ak dimanch 6 me 2018. Senkyèm festival liv sa a se yon kokennchenn evennman kiltirèl e literè ki pral resevwa ekriven, libreri, distribitè liv, atis ak yon tralye atelye travay sou atizay. S’on prezantasyon Sosyete Koukouy, poto mitan kilti lakay, ak Miami Book Fair ki mete sou pye pwogram ki rele ReadCaribbean. Evènman sa a gratis e li ouvri pòt li bay tout moun. L ap fèt nan Konplèks Kiltirèl Little Haiti (Little Haiti Cultural Complex), 212 NE 59 Ter. Miami, ak nan Libreri Mapou, 5919 NE 2nd Ave, Miami, FL. ki tou kole avèk konplèks la. Tout moun alawonnbadè envite. Nan “Little Haiti Book Festival,” pral gen prezantasyon otè ayisyen (Ayiti ak Dyaspora), deba ak konferans sou literati k ap bay lang kreyòl la tout onè ak merit li genyen. Ap gen atelye ekriti, lekti ak tout kalite aktivite pou timoun, atelye dans, pèfòmans pwezi, dans, mizik, elatriye. “Little Haiti Book Festival” jwenn bourad nan men Afè Kiltirèl Konte Miami-Dade (Miami-Dade County Cultural Affairs), Vil Miami ak Komisyonè Keon Hardemon, Konplèks Kiltirèl Little Haiti (Little Haiti Cultural Complex), Kimberly Green Latin American and Caribbean Center nan FIU, Fondasyon Green Family, Konsila Ayisyen, HALO (Haitian American Leadership Organization), Fanm Ayisyen nan Miami (Haitian Women of Miami), SANT LA, Libreri Mapou, Haitian Cultural Arts Alliance, elatriye. 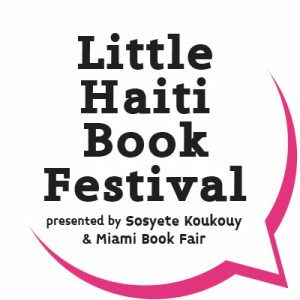 “Little Haiti Book Festival” (ke yo te rele anvan “Haitian-Caribbean Book Festival”) se yon lide Sosyete Koukouy. Li fèt an kolaborasyon avèk Miami Book Fair, ki chita nan Miami Dade College e ke yon konsidere kòm pi gwo festival liv nan peyi Etazini. “Little Haiti Book Festival” jwenn bourad nan men Afè Kiltirèl Konte Miami-Dade (Miami-Dade County Cultural Affairs), Vil Miami ak Komisyonè Keon Hardemon, Konplèks Kiltirèl Little Haiti (Little Haiti Cultural Complex), Fondasyon John ak James L. Knight, Kimberly Green Latin American and Caribbean Center nan FIU, Fondasyon Green Family, Konsila Ayisyen, HALO (Haitian American Leadership Organization), Fanm Ayisyen nan Miami (Haitian Women of Miami), SANT LA, Libreri Mapou, Haitian Cultural Arts Alliance, elatriye.